Discharge the refrigerant. Refer to HA-23, "Recycle Refrigerant". Reposition the hood lock assembly. Refer to DLK-154, "HOOD LOCK CONTROL : Exploded View". Disconnection of the hood release cable is not necessary. Remove the core support upper. Refer to HA-39, "Exploded View". Remove the front grille. Refer to EXT-23, "Removal and Installation". 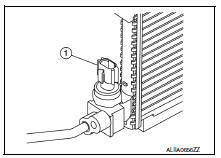 Disconnect the harness connector from the refrigerant pressure sensor. 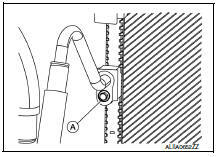 Remove the bolt (A) that retains the high-pressure flexible hose to the condenser, then disconnect the high-pressure flexible hose from the condenser and liquid tank assembly. Cap or wrap the joint of the hose with suitable material such as vinyl tape to avoid the entry of air. 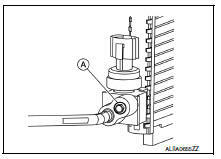 Remove the bolt (A) that retains the high-pressure pipe to the condenser, then disconnect the high-pressure pipe from the condenser and liquid tank assembly. Remove the condenser and liquid tank assembly. Apply A/C oil to the O-rings of the condenser for installation. After charging refrigerant, check for leaks. Refer to HA-21, "Leak Test". 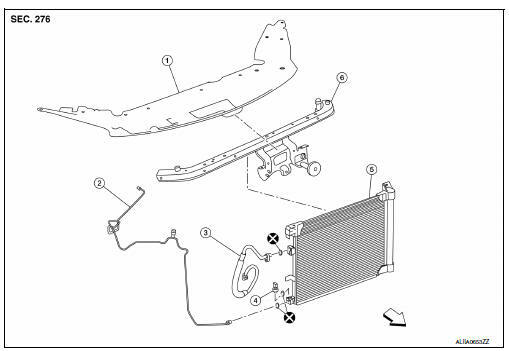 Remove the refrigerant pressure sensor (1) from the liquid tank on the condenser. Do not damage the condenser fins. Do not reuse the O-ring. Apply A/C compressor oil to the new O-ring for installation.